Master Angler musky from Van Buren county caught this weekend. 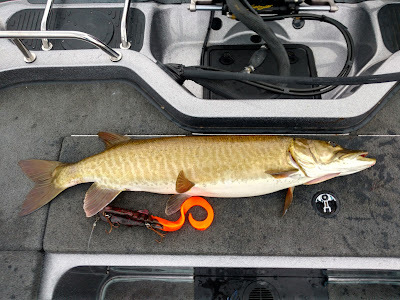 Chances are you also have muskies living in lakes close to your home. If you live near lake St Clair, we all know it's a musky mecca. To find muskies near your house check with the Department of Natural Resources or Game and Fish for your state. Michigan posts their fish stocking history on their website. Find a lake that has stocked fish at least 5 years ago and spend some time on the water. This musky just crushed a bull dog fished deep on a break that went into 25fow. Great fight and a great way to break up your summer and fish for something different. Please remember catch and release with all muskies! Fished out of South Haven for some spring lake trout. This time of year the lakers are close to shore in 50-60 fow. Salmon gear such as spoons and trolling flies will catch fish, spin n glo's and cow bells have been more effective. I'm also experimenting with jigging once the fish are located. Several follows on the graph last night, could be a great way to break up the trolling routine once we get them dailed in. We made a quick trip to the Pere Marquette River this weekend for some spring steelhead fishing. Baldwin had about 4" of new snow and the morning felt much more like a winter fishing trip! High and dirty water made fishing tough, but we managed to put a few nice fish in the net and battle a couple other hot fish that we couldn't get our hands on. Fishing will continue to improve after the recent full moon and as the high water recedes, good luck out there! Escaped the snow of Michigan and made a quick trip down to Arkansas to fish the White River for brown trout. This time of year trout are hungry after finishing their spawn and will crush big streamers. Best flies on the trip were deceivers in both single and articulated. Some fish came on shad colors but yellow/olive colors turned more fish. Will caught the fish of the trip with the 28.5" monster pictured above! Fished the Muskegon River for summer smallies this weekend. Ended up exploring some new water in the lower river and making a long 10+ mile float. Johnny boated fish of the day with this chunk of a smallmouth taping out at 19.5". Most fish came on baitfish colored streamers with our hot fly being a white and grey murdich minnow. Best water was the swifter outside bends that had deeper water and some boulders. Also found fish in the flats among the downed timber. Great way to spend a summer day, practice throwing streamers, and put a bend in the rod!